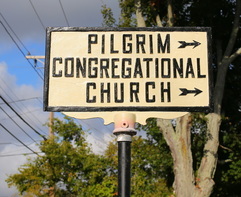 Pilgrim Congregational Church is a happening place. To learn more about sa past event simply click on the event title under the "Past Events" tab.. Hope you can join us! Every Thursday evening during July and August come join Pilgrim from 6:30-7:30 pm for dinner and fellowship! Some dinner themes include: game night, cook-out and ice cream. There is a parking lot and the building is accessible via an elevator and ramps. Communion is served the first Sunday of the month and ALL ​are welcome to receive.